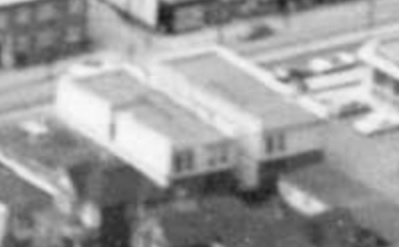 Aerial view of the West End showing the increase of apartment buildings west of Cardero Street, 1957, Vancouver City Archives – Dist P133. 980 Denman Street was the site of Denman Court, a brick apartment building on the east side of Denman Street. It was at the southeast corner of Denman Street and the lane between Barclay Street and Nelson Street. There is one reference to this property in Heritage Vancouver Society’s database of historic building permits:http://permits.heritagevancouver.org/index.php?cID=1 [searched July 7, 2014].